I am planning to drop mini parachute guy from my FT mini guinea cargo plane. I was just wondering what material you guys use to make your parachutes , how you make them, how to fold it and wind the string so that the parachute open every time and how big to make it? Just a plastic trash bag, cut into a circle with a 10c sized hole in the middle will do for most GI Joe sized paratroopers. Position heavy duty sewing threads equally around 4 or more points on the canopy, then tie them all at the bottom so they are the same length, then attach to your potential parachutist. Test out a handy upstairs window. 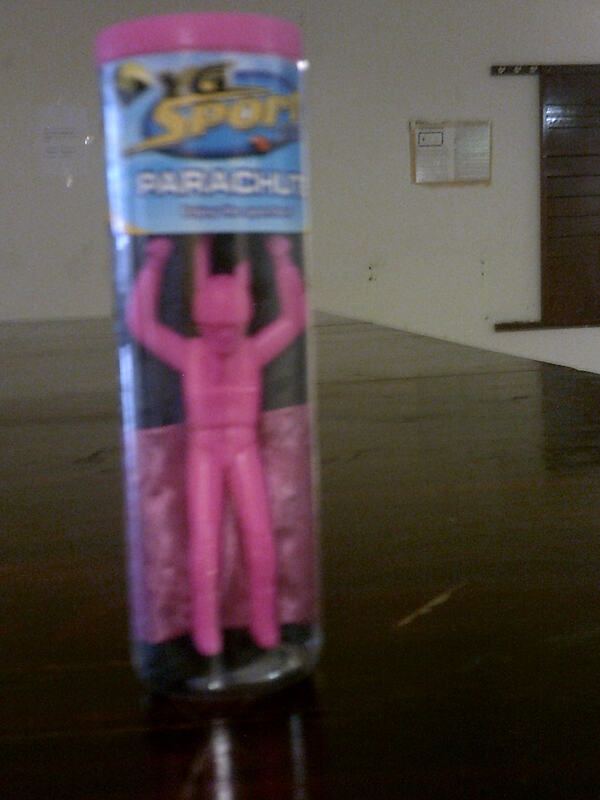 Ok, What should I use to attach the guy the the parachute? Just string? Thin string should work just fine. I learned how to fold (pack) a parachute from model rockets, you might google that. Then fold the bottom corners in so it basically makes a strip. Start rolling the strip down from the top (center point) and continue to wrap LOOSLY with the lines until you have a nice tidy package. Ok! I'll look next time I go to Dollar Tree. Position heavy duty sewing threads equally around 4 or more points on the canopy. Heavy duty sewing thread, available nearly anywhere for sewing buttons, probably some in your house. Any thinner twine will do. I always used to use floss for model rockets and other small thread jobs. The wax seems to make it less likely to tangle and it's super strong. That’s a great idea. Easy to get too. You couldn't build one for that price! Just what went down here! When I was little we used hankerchiefs. But plastic bags sound good. Something thick enough to hold up. I would look into getting some paper grommets for binder use to reinforce the holes. Dust the chute with talcum powder to increase the odds of an opening chute. One question: just ONE guy?? Come on. About how heavy are they? I can't carry to much wait in the mini guinea. Ok, I have never heard of putting talcum power on. Just one guy! NOT ME! I'm plane on dropping 3-4 witch is about all the mini guinea can carry. Just weighed mine on the postage scales and it came in at 19 grams, (without the display case of course). Here we Pool them if anyone wants a multi parachutist drop but normally it is almost a case of diving bombing with them to get closest to the target. (they float a long way in a slight breeze if dropped from height). How much weight do you think I can carry in my mini guinea? Right now my MG is 14oz with out the battery. I would think 3-5 Oz would be about it. Unless you have a huge motor. It all depends on how the plane flies and how it is powered. A powerful setup with a good large SF prop and fitted with flaps can often easily support loads up to around 50% of the empty weight, (subject to the structural strength of the build), whereas a normal setup with a standard prop. (no flaps) I normally rate for a max load of 10% of the bare weight. It all depends upon The build. weight, flying speed, and power/thrust available. @Merv 's estimate of around 20% is a good average. If you have lifting issues please do not forget that the main wing incidence can also be a limiting factor when trying to lift significant payloads! BTW: Another good thing to drop is small gliders, lots of fun, especially when they catch a thermal and fly away . Also fun to try to hit them as they glide down,gives you a challenge . Also fun to try to hit them as they glide down,gives you a challenge .